Buckwheat honey is gathered by honeybees from the nectar of the delicate white buckwheat blossoms, and uncommonly limited plant source. It is dark in color and has a distinctive flavor. Due to it's unique wellness benefiting properties, buckwheat honey is recognized as a functional food. Our premium raw buckwheat honey is carefully harvested to preserve all the nutrients that nature provides. 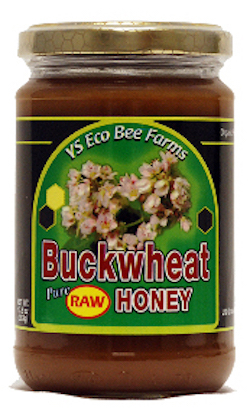 Enjoy the wellness benefits of Raw Buckwheat Honey!